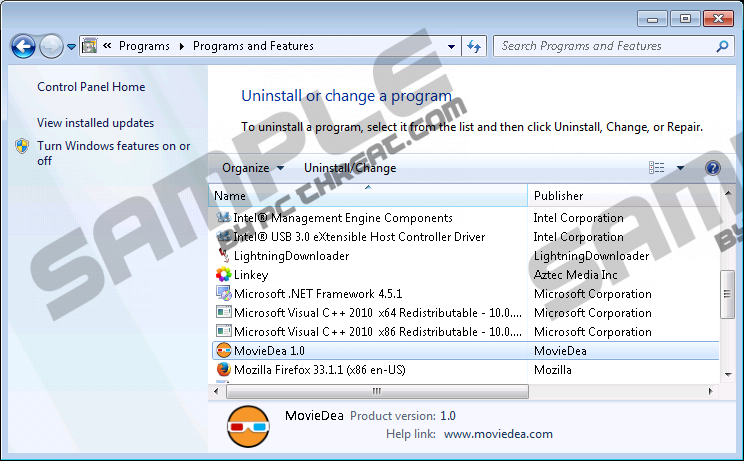 MovieDea is one more adware application that uses devious marketing strategies to trick Internet users into downloading and installing an application that holds not beneficial values whatsoever. Even though, MovieDea is advertised as a tool that should enhance your online video watching experience you must know that it comes with a certain catch to it. Although, it delivers the service that it is advertised for, but along with that it will provide a ton of third-party content that will make browsing the web so much harder. Using your web browser will be a task that will most likely cause endless annoyance as long as MovieDea is active on your PC. Read the rest of this article and find out how MovieDea functions and why its removal should be your utmost priority. The primary indication that MovieDea is up and fully running on your operating system is a web browser flooded with numerous third-party commercial ads and annoying pop-ups. All of these ads and pop-ups will be presented to you in a random way whether you like it or not. It goes without saying that this will make your online experience annoying and frustrating at all times. Every single time you will decide to browse the web you will need to fight trough numerous unwanted ads and pop-ups. MovieDea will continue to annoy you till the very minute that it is completely removed from your operating system. Besides being incredibly annoying, it has been discovered that MovieDea could turn out to be quite malicious as well. Some ads presented by MovieDea could be implemented with various redirect links. This is more than dangerous because of the consequences that you could face just by clicking on a single ad. You could be redirected to websites that might be running an arbitrary code execution exploit. This exploit is very popular among malware distributors due to the fact that it allows to install a malicious piece of software without any authorization i.e. just by landing on such a website will most likely be enough to get your PC infected with some unknown malware. By clicking on an ad presented by MovieDea, your system could get infected with Trojans, keyloggers, or even rootkits. If you are a security conscious user it should be more than obvious to you why the removal of MovieDea should be carried out without any hesitation; otherwise you could face devastating outcomes. Do not delay the removal of MovieDea as it is the only way to safeguard your PC from other malicious Internet-based infections. It is crucial to remove every single bit of MovieDea because even a few leftover files or registry entries could be used by other infectious applications on the web as a gateway into your PC. This is the primary reason you are advised to scan your operating system with a professional antimalware tool once you have executed the manual removal. If you fail to do so, you risk of getting your PC infected with dubious programs in the near future. Remove MovieDea by double-clicking it. Confirm that you want to remove MovieDea. Select MovieDea and then click Remove. select MovieDea and click the Uninstall button. Quick & tested solution for MovieDea removal.